The settlements of Western Europe experienced a period of significant transition following the decline of Roman control in the 5th century AD. The movement of people and ideas resulted in change and reorganisation for many communities living in what had previously been Roman settlements. Such developments occurred both within the boundaries of the old structures, and by expanding or moving beyond those existing limits. Many of those sites which saw significant change developed slowly over a longer period of time, often not taking the recognisable Medieval shape until at least the 12th century. 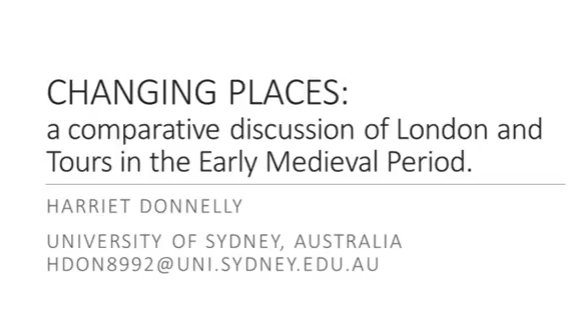 This paper examines the developmental stages that occurred at two settlements which saw significant changes from the 5th to 12th centuries AD; London and Tours. Both developed according to a pattern of twin towns with the two halves divided by a small area with limited occupation. London and Tours were both hugely important settlements and a comparative discussion of respective changes at each site during this period highlights the various methods by which such settlements developed as well as providing insight into both a trade driven and monastic model of the twin town phenomenon. Examination of these sites and how they changed during the Early Medieval period, will enable a deeper understand of the complexity of urban development and transitional processes.